Black has a clear advantage at this stage. 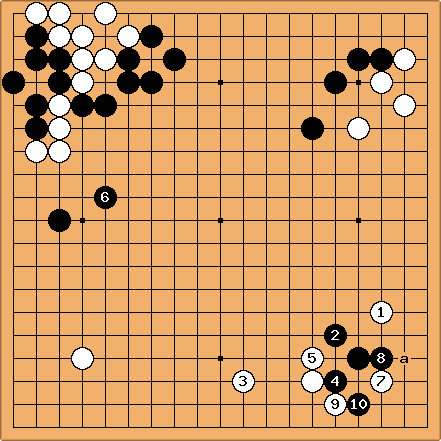 The ponnuki was very painful for White, and White has to solve several problems at the same time. The area at the top needs reduction. If Black expands it, it might become too large. Another problem is the group on the left. If it tries to survive, it might turn out that the top would become really huge. At the same time White does not really have territory anywhere. White starts with in hope of squeezing the black group here from both sides and run it into the center. 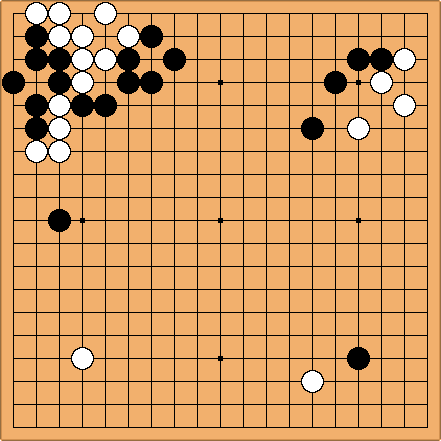 As the black group runs, White will obtain something in the center too - which will make reduction of the top easier. naturally separates the white groups. intends to build some base for the attack. But it is too mild. Black counters with and after White plays Black plays tenuki to attack the white stones on the left. White now has to continue the attack on the lower right corner. But does it clumsily and was a mistake. Black cuts off this stone with . White could play at a, still taking the corner, but Black would get a wall. That would be better than what happened in the game. White played and the most White obtained was saving the stone 8, which is too little at this stage of the game. Black easily lived in the corner and it was White's position that looked vulnerable. is a usual corner defence tesuji in this situation. Thus White lost the fight in the second corner. Things could not be grimmer for White. The game seems lost, but resigning after 51 moves is not in the spirit of amateur Go. : The reference above to "saving the stone 8" seems unclear, since it is a black stone, not white.